Over the next two weeks, I will release my All-Time team for each of the 12 Atlantic Coast Conference. Each team will consist of 5 starters (at least 2 guards and 2 forwards) and 4 reserves to make up a 9 man rotation. The team can only include players who played their entire career in the last 50 years (sorry Ronnie Shavlik) and only their accomplishments in college taken into consideration. Corchiani finished his career as the NCAA career leader in assists with 1,038. As a SR, Corchiani averaged 16.3 points, 9.6 assists and 2.9 steals and was named 2nd Team All-ACC as well as being named on various All-American teams. Although much more of a passer, Corchiani was a capable shooter who knocking down 40% of his attempts from long range and formed the "Fire & Ice" tandem with Rodney Monroe that lead the Pack to the 1989 Regular Season ACC Championship. Corchiani finished his career 1st in State history in assists and steals. Monroe is one of the purest shooters in the history of the ACC. Monroe was 1st Team All-ACC performer as a SO and SR and a 2nd Team All-ACC performer as a JR. Monroe was named ACC Player of the Year in 1991 after averaging 27.0 pointer per game on 44% shooting from downtown, 4.4 rebounds and 2.8 assists. Monroe scored a career high 48 points including 31 in the second half in a win over GT in 1991. Monroe is the leading scoring in NCSU history with 2,551 points. Thompson was named All-Tournament in every Tournament of his career led the Pack to a 79-6 record including the 1974 National Championship. Carr was 1st Team All-ACC in 1976 and 1977 along with being named to various All-American lists in both seasons. As a SO, Carr averaged 26.6 points, 10.3 rebounds and 2.1 assists per game. As a JR, Carr averaged 21.0 points and 9.9 rebounds per game. The 6’8” Carr was a physical power forward who could step out and shoot the ball from the perimeter, put the ball on the floor as well as doing the dirty work in the paint a combination that was almost unheard of in that time period. Carr was a member of the 1976 Olympic Basketball team that won Gold in Montreal under Dean Smith. Carr left NCSU after his JR season for the NBA. The most underrated player in State history in my opinion. Although overshadowed by Thompson during his career at State, Burleson was a dominate center who in my opinion is the second greatest player in NC State history. Burleson was named All-ACC in each of his 3 years on varsity taking home 1st Team honors as a SO and JR and 2nd Team honors as a SR. Burleson was a consensus 2nd Team All-American in 1973 along with being named to various All-American lists in 1974. 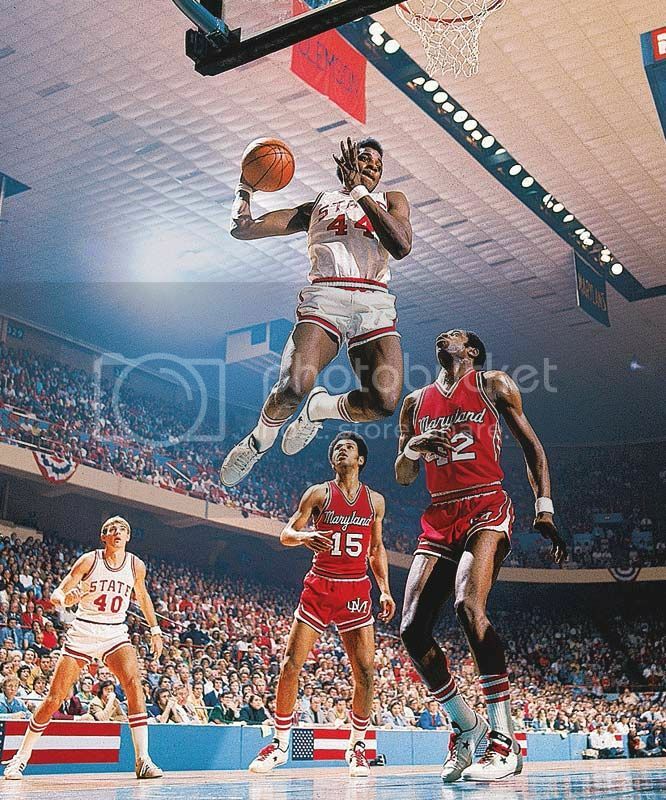 The 7’4” Burleson was a two-time winner of the Everett Case Award as the ACC Tournament MVP the second award coming on the heels of a 38 points and 13 rebound effort in the best ACC Game ever played against Maryland in 1974. Burleson averaged 19 points and 12.7 rebounds for his career and lead the ACC in rebounding in 1972 and 1973. Hodge lead NC State to the NCAA Tournament in each of his four years in the program including a run to the Sweet Sixteen in 2005. As a JR, Hodge was a consensus 3nd Team All-American and ACC Player of the Year after averaging 18.2 points, 6.4 rebounds and 3.6 assists. Hodge was named 1st Team All-ACC in 2003 and 2004 and 2nd Team All-ACC in 2005. Hodge finished his career 3rd in scoring with 2,040 points. Lowe was 1st Team All-ACC as a SR and 2nd Team All-ACC as a SO. Lowe lead NC State to the improbable 1983 National Championship where he was named to the All-Tournament Team. Lowe was never known for his scoring ability, but was a leader with terrific court vision and a excellent defender. Lowe averaged 11.3 points, 3.7 rebounds, 7.5 assists and 2.4 steals as a SR.
Gugliotta improved dramatically over the course of his career going from a seldom used FR to a 1st Team All-CC and All-American peformer as a SR. As a SR, Gugs averaged 22.5 points while knocking down 40% of his attempts from behind the arc, 9.8 rebounds, 3.1 assists and 2.0 steals per game. The 6’10” Gugliotta was outstanding in all facets of the game finishing in the Top 15 is almost every statistical category in NC State history. Whitney had a consistently successful career with State for four seasons. Whitney burst on the scene becoming the only State player to win ACC Rookie of the Year in 1977 after averaging 14.6 points and 5.8 rebounds. Whitney was named 1st Team All-ACC in both 1979 and 1980 as well as being named to various All-American lists as a SR. Whitney averaged 16.8 points on 50% shooting, 5.6 rebounds, 2.2 assists and 1.4 steals for his career. You could make a strong case for Todd Fuller, Lorenzo Charles and Thurl Bailey here as well.